You may help a 4 year old color a paper, a 10 year old memorize verses, or play in the pool with your campers! 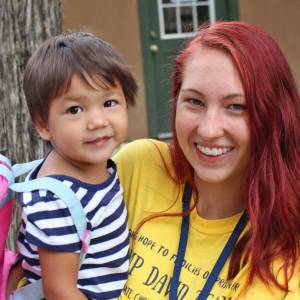 Your campers usually come from healthy homes, but they are at Camp David because their parents are volunteering in the kitchen or elsewhere, and we want to give them a fantastic camp experience! These kids need to make happy memories and grow in their relationships with Jesus at camp too! The Green Team campers can be from ages 2 to 12, and team size also varies per day (some days there are 5 kids and other days there are 8!) These dynamics make this camp program a valuable learning experience in Children’s Ministry! This is not a babysitting service, your goal is to mentor and build up your campers so they can experience God and life in a new way at camp! Responsible For: Care of campers Monday afternoon through Friday morning. Get your strength in the Lord– spend time alone with the Lord everyday. Be in the Word! This may mean getting up earlier than the campers, or using some free time to get alone with the Lord. Be sensitive to the spiritual, physical, and emotional needs of your campers. Be available and ready to listen to them. Be aware and deal quickly with brewing problems and conflicts, especially between siblings or full time staff kids. Talk personally to each of your campers about God and give each the opportunity to make a decision to follow Christ. Be a part of your wagon team without being one of them (be child-like, but not childish). Campers look to the leader for friendship, but also for authority. Take advantage of “teachable moments,” such as a butterfly on a plant to talk about God. Be sure campers are on-time and present for all activities, unless you have cleared an exception with your director. Be adaptable and age– appropriate. One day you may be working with the 4-6 yr olds and the next with the 10-12 year olds. Communicate with the Day Camp Director when you have continued conflict or disrespect from campers. Participate in debrief meetings at the end of the week. Abide by and cooperate with CDO polices and help Green Team kids do the same. Fill out Character Awards, and the Staff Weekly Evaluation forms on Fridays. Pray for creativity, patience and love for your campers. Ask God to show you how to connect with them and give a listening ear. Help them to learn and to have a great summer!